Korbin seen with his friend Caleb, who tried to save him from the attacking dogs. UPDATE 12/05/17: On Tuesday a resident of Daniel Morgan Road, who lives next door to the owner of the dogs that killed an 8-year old boy and injured another, spoke about the history of the dogs. Donald Blanton said that he and his wife have had problems with the dogs for years. "When I was cutting my grass I carried a gun to make sure the dogs didn’t come at me," he said. "When I was outside I just carried a stick with me to make sure the dogs didn’t come at me." Blanton said he has contacted the Cherokee County Sheriff’s Office in the past, which directed him to animal control. Despite many calls about the dogs, Blanton said that animal control only came out once to pick up one of the dogs. Then they returned that dog to its owner. Blanton said his neighbor also had problems with the dogs and voiced them to animal control. “The dogs kept going over there getting into (the neighbor’s) fence and killing his chickens and ducks," he said. No criminal charges have been filed and none are expected to be, despite the dogs escaping their property and attacking two children and killing one. As Blanton tells WYFF, "I really think something should be done. Instead of just sweeping it under the rug." Cherokee County Sheriff Steve Mueller said there were no reports of the dogs "being vicious," which translates into no previous reports to animal control of a person being attacked and bitten by any of the dogs. On Thursday, family and friends will gather to celebrate Korbin's life. Korbin Williams, 8-years old, was a student at Northwest Elementary School. A superhero is expected to attend his funeral service as well. John Buckland, who portrays Batman, is driving his "Hopemobile" from West Virginia to attend the funeral to honor Korbin and Caleb, his 8-year old friend who tried to save him from the dogs. Buckland will drive Caleb in his tricked out Batmobile to attend Korbin's funeral. New details have been released after three dogs mauled an 8-year old boy to death and injured another boy on Friday in Gaffney. Korbin Williams was pronounced dead at the scene. Two of the dogs were shot to death by arriving deputies. The third dog was shot and killed by a neighbor Saturday morning, Cherokee County Sheriff Steve Mueller said. All three canines were sent to the S.C. Department of Health and Environmental Control to test for rabies, Sheriff Mueller said. The three dogs belonged to Korbin's neighbor, Mueller said. Korbin's mother had been caring for the animals while the neighbor was out of town. Korbin and his mother had been to the home earlier that day to feed the dogs. Mueller believes the dogs escaped the neighbor's yard by crawling under the fence. The dogs attacked Korbin and his friend on the roadway across from his home. His friend managed to escape and alert his mother and another neighbor to the attack. It is unknown how long Korbin and his mother had been caring for the dogs. Mueller did not name the identity of the dogs' owner, but did say he will be presenting their findings to the Solicitor’s Office to determine whether the case warrants any criminal charges. Mueller described the three animals as "mixed-breed dogs." In the Cherokee County Sheriff Dispatch archived recording of December 1, the dispatcher described the dogs as, "Two pit bulls and one German shepherd." Gaffney, SC - An 8-year old boy is dead and another suffered injuries after being attacked by multiple dogs on Friday afternoon. The two children were walking down the road from one home to another in the 300 block of Daniel Morgan School Road when the dogs attacked, Major Richard Turner of the Cherokee County Sheriff's Office said. Deputies located two dogs at a nearby home suspected in the attack. The dogs became aggressive and deputies fired on them, Turner said. A third dog was also involved in the attack. It fled the scene and is not in our custody at this time, Turner said during a press conference. Deputies responded to a call about 4:15 pm reporting that dogs were assaulting a child. When deputies arrived at the scene, two of the dogs were inside a fenced-in area. Police are currently trying to identify the dogs' owners. The Cherokee County coroner and investigators are at the scene investigating the fatal attack. The second child apparently only suffered minor injuries. A description of the dogs has not been released, but they are believed to be neighborhood dogs. Cherokee County Coroner Dennis Fowler identified the child as Korbin Michael Williams who attended Northwest Elementary, reports The Gaffney Ledger. 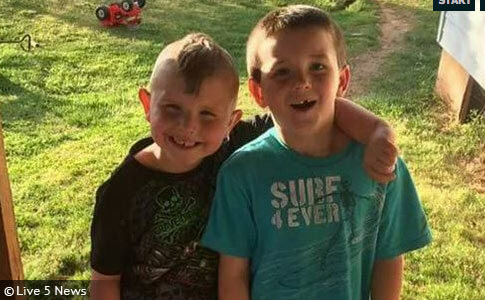 "Korbin sustained multiple bites over his body by the dogs while the other boy was bitten once on the leg," Fowler said. "While the dogs were still attacking young Korbin, his friend ran to his nearby home for help. The friend’s mother and a neighbor rushed to Korbin and called 9-1-1." Korbin was pronounced dead at the scene. An autopsy conducted Saturday revealed Korbin died from blood loss due to puncture wounds inflicted by the dogs, coroner Fowler said. "This is an absolute tragedy," Fowler continued. "The boy was familiar with the dogs having cared for them by feeding and playing with them daily. He had just fed them on Friday minutes before the attack occurred." The search for the third dog was ongoing as of Friday evening, Major Richard Turner said. Deputies shot and killed the other two dogs after they behaved aggressively toward them. As of Friday evening, investigators have still not spoken to the dogs' owner, Turner said. BroadCastify offers live and archived recordings of public safety audio streams across the country. Late Friday we analyzed the archived stream from Cherokee County Sheriff Dispatch from December 1, (4:17 pm to 4:47 pm). At 2:20 into the archive, it states, "Dog is attacking a child 301 Daniel Morgan School Road." At 6:58 it states, "Child is breathing, he's unconscious, 8-year old male, all the dogs have been [shooed off] at this time. Two pit bulls and one German shepherd." This indicates that a 9-1-1 call came in describing the three attacking dogs as two pit bulls and one German shepherd. People do not usually confuse pit bulls with German shepherds. The sheriff's office has still not released any breed information, which greatly fuels online rumors. Deputies shot and killed two of the dogs at the scene. Yet, Major Richard Turner has stated multiple times to the media that breed information is unknown; this was true regarding the still at large dog too. The death of a child from a vicious dog mauling is horrific for every community and for every first responder who arrives at the scene. Yet when one of the attacking dogs is still roaming at large, it is unfathomable not to release a description of the dog (such as its coloring and size), along with any suspected breed information. Animal control usually picks up the carcasses of the shot dogs quickly too. So breed information is known, but is not being released for whatever reason. Not another DBRF! One article identified the dogs as possible German shepherd/boxer mixes. More information will no doubt come out later. No one's child should ever die because of a damn dog. And why aren't the authorities releasing information about the breed or pictures of these 'dogs'? The 911 call ID'd the dogs as two pit bulls and a GSD. I doubt they were misidentified. The child knew the dogs too. Years ago when I first began learning about maulings and fatalities of pets and people, I asked a Game Dog Forum about a similar dog on child attack. I thought I'd be told "those dogs were abused" or perhaps "that child must have tormented the dogs", but no. Pits attack and kill dogs. You can judge the morality of a nation by how the animals are treated. Compassionate moral nations would not permit dog fighters to continue to breed game-insane fighting dogs. Now that dog fighting is illegal, it's time to make the breeding of fighting dogs illegal as well. "The death of a child from a vicious dog mauling is horrific for every community"- Is it? If so they will ban these junkyard dogs and they will pass laws dictating what proper containment is. We'll see. Any word if they have found the as of yet identified missing dog? Hard to believe they are looking for it too hard if they won't announce what it looks like. If anyone gets hurt by this still at large dog of mystery they should sue. So this child and his mother we're taking care of these dogs and the dogs killed the child. Goodie. I can remember when looking after a neighbor's dog didn't put one in mortal danger. There are a lot of rumors on social media, but we can't make heads or tails of them, because the people who are spreading them cannot be trusted. One of them was if the neighbor was "out of town" or if he moved away and abandoned the dogs. More than one family lives at the same residence as the boy. What we do know is that one of the 911 callers called in a description of the dogs that was far more descriptive than "mixed-breed" dogs. This was a repeated, sustained attack. It reportedly began at 3:45 but dispatch logs show sheriff's deputies did not receive call until about 4:17. I have owned and and cared for Kennels with as many 30 plus dogs and have seen it time and time again. 99% of the time it's pit bulls or Pitbull mixed dogs n which these horrific attacks occur. Family pets,…oh we don't know what happened….he was raised with us from a puppy…and so on. And this misdirected belief that they only attack things dog sized. Get real folks. It's in their psyche'. It was bred in them long ago, it's deep rooted n their brain. That's what they where bred to do. And one day…it shows itself and tragedy occurs. I sorry but you'll never get it out of them. I know not all pitbulls in the world have attacked someone or something, but always remember the potential is there for it to happen.